SAILOR Fleet One is the ideal communication solution for yachts, motorboats and small fishing vessels. SAILOR Fleet One enables leisure sailors and fishermen to stay in contact with family, friends and business partners when outside their mobile telephone coverage. 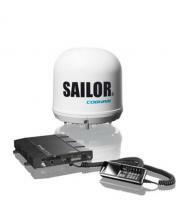 Based on the well-proven SAILOR platform, SAILOR Fleet One offers a cost effective hardware solution and together with the tailored airtime, a satellite communication solution within reach. SAILOR Fleet One is a maritime broadband system, providing simultaneous high-speed data and voice communication via satellite which uses Inmarsat BGAN (Broadband Global Area Network). It is an entry level satellite communication equipment based on well-proven hardware and network technology. The system consists of a terminal and a stabilised maritime antenna. Used with a phone or computer the SAILOR Fleet One gives you access to 100 kpbs Internet browsing, E-mail and a one voice line phone service. Fleet One is a global service, however the specific Fleet One tariff is only available in selected geographies (green areas on coverage map below). Roaming outside the Fleet One home region areas will have an impact on the airtime prices. The special Fleet One tariff will apply to traffic originating within the Fleet one service area. Meaning leisure sailors will be able to use the Fleet One tariff in the Mediterranean during summer and the Caribbean during winter with the same subscription. However, when crossing the Atlantic users will be outside a home region and roaming costs will apply. Full details regarding the charges are available from Livewire Connections. Building on the proven SAILOR Platform with more than 35,000 terminal in the market. Small, lightweight and compact solution for easy and simple user installation. Built-in PABX. SIP server for easy connection of additional IP handsets and smart phone SIP clients. Control Data connection via handset of I/O pins.